Welcome Home, take advantage of this turn key home without the price of a newly renovated house. 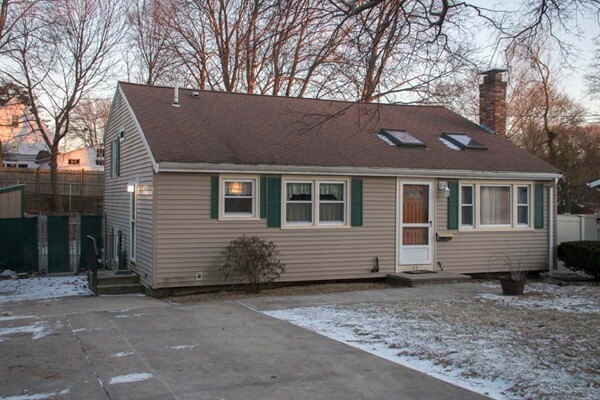 Located in a great North Weymouth neighborhood and conveniently located to route 3A and public transportation for the commuter. Eat in kitchen boosts custom cabinets and stainless steel appliances. Living room has cathedral ceiling with 2 skylights and a fireplace. Roof is less than 10 years and new furnace was installed in 2018. Great for entertaining with a good size private back backyard with pool and large driveway. Backyard currently has a separate fenced in area for your furry family member. House is within walking distance to Johnson early childcare and less than 1 mile from the elementary schools. Lane Beach and Wessagusset Yacht club are less than 2 miles away for the ocean enthusiast and the 4th of July fireworks. This home would ideal for first time home buyer or someone looking to down size. seepage through basement door during heavy rains.